Straightline Dance Fitness offers recreational dance classes for children. In a supportive and nonjudgmental environment, we explore our physical abilities and learn how to use movement to nourish our brains, bodies, and souls. Whether continuing from the fall sessions or joining in January, our winter session will keep your kids moving and prevent cabin fever. At Straightline, kids classes are not performance-based--we promote dance as an everyday activity. A welcoming introduction to dance class. Parents may initially participate with shy kids as they warm up to the class environment. Dancers learn dance basics, such as plies, chasses, and skips, in the midst of games and imaginative play. We work on listening skills, music responsiveness, coordination, and furthering physical development. A leotard and ballet shoes are recommended, but nonrestrictive clothes and bare feet or nonskid socks are fine. ​An introductory class for kids who are comfortable in a dance or class setting. 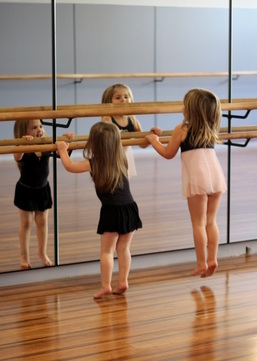 As we introduce ballet techniques, the kids will practice in fun creative ways while gaining balance, control, flexibility, and rhythm. Phrase work helps students put dance into action! Introduce your child to the world of ballet in an enchanting class that includes stories and dances. A new story is highlighted each week. Using themes from the stories, movement will be guided by ballet techniques with props and accessories. Leotards, tights, and ballet shoes recommended. A foundational class using Jazz and Ballet to hone technique and general skills needed in dance, like body awareness, motor skills, rhythm, coordination, and musicality. Class begins with a warm-and stretching. Students will then work across the floor and put those movements into use during the choreography section. Musicality, hard hitting movements, body isolations, energy, textures, breaking, popping, and freestyle are some of the elements that we'll cover. Students will be encouraged to bring their own style to the choreography. Comfortable clothing and clean sneakers. ​Announcing Parent Repair: Let’s rev the engines, fine tune your physique, and blow off some steam! Mid-morning classes paired with childcare and children’s classes give you the freedom to focus on you! Starts Mid September!